Join Team WSB for a sporting challenge in 2018! Lightwater resident Katy Evans is running the Weybridge 10k for Woking & Sam Beare Hospices on Sunday 1 April. She is urging local people to put on their running shoes and join Team WSB for both this race and the Mercer Surrey Half Marathon on Sunday 11 March. Katy, her sister Jody and mum Sheila were supported by the hospice when their dad, Keith Evans, passed away from cancer after a six-year illness in July 2017. Katy said: ‘You don’t think about a hospice until you need it. 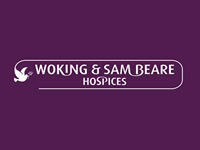 My family and I want to make sure Woking & Sam Beare Hospices are there for other families too when they need it, so we’ve planned lots of fundraising activities in aid of the hospice and in dad’s memory. ‘Dad had been ill for six years before he passed away. Although he was in and out of hospital during that time, he had been relatively well until close to the end, so when we realised he didn’t have long left, it was a shock. From the time the community nurse first visited Dad at home to when he passed away at the hospice, the care we all received, and are still benefitting from, has been first class. ‘The last five weeks of his life were a bit of blur, but the support we had from the hospice during this time made us more able to cope with Dad’s death. ‘Dad was only in the hospice for 72 hours, but we are so glad he made it there. It was an intense and stressful time but as soon we arrived we all felt a massive sense of relief. It’s such a calm and peaceful place, not frightening at all, and the staff took over so we could focus on being together as a family with mum and dad. You can join Katy and the rest of Team WSB; find information and sign up for all the Mercer Surrey Half Marathon and Weybridge 10k at www.wsbhospices.co.uk or contact the Events Team on fundraising@wsbhospices.co.uk or call 01483 881 752. For information about the Weybridge 10K Run, click on the logo above.